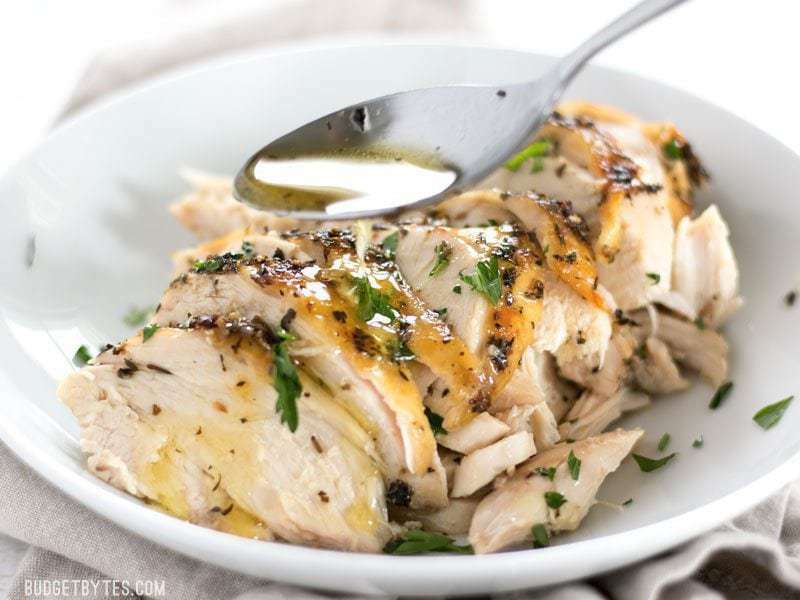 I really like having pre-cooked chicken in the fridge that I can use to quickly whip up a sandwich or wrap, or add protein to a bowl of pasta, salad, or one of my “leftovers” bowls. While I often use a rotisserie chicken for this purpose, they are sometimes just too salty and we have a hard time going through a whole chicken between the two of us. So, this week I experimented a bit more with the “low and slow” roasting method and made these incredibly tender and juicy Herb Roasted Chicken Breasts. I first used the “low and slow” technique with my Oven Roasted Chicken Legs and was really pleased with not only the texture of the meat, but the delicious juices that were left in the dish after roasting. This time I combined the butter with a trio of herbs and slathered it over two bone-in, skin-on split chicken breasts. The breasts were quite large, so I lowered the heat a bit and let them roast even longer before removing the cover to let them brown. The results were even more incredible. I pulled the meat from the breasts after cooking, drizzled the juices over top, and have been snacking on the meat all week. 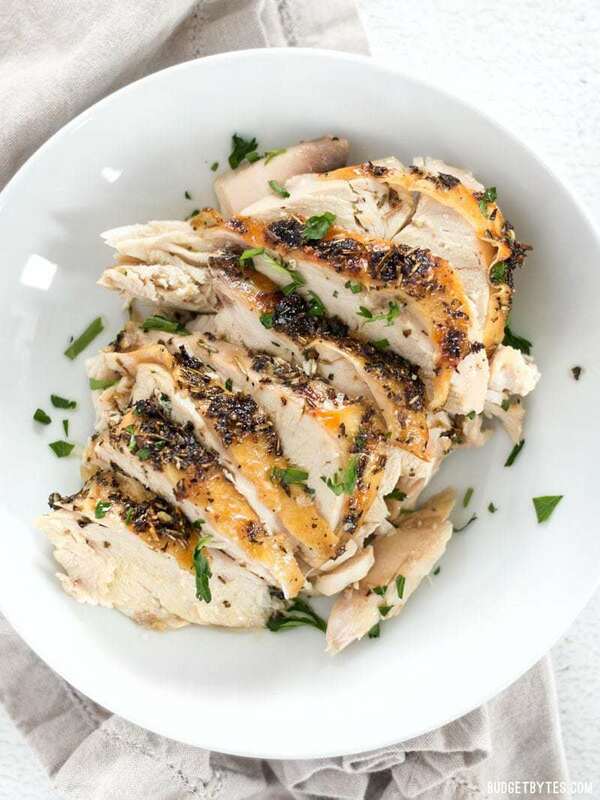 Can I Make Herb Roasted Chicken Breast in an Instant Pot? You ready for the most tender and juicy chicken breast EVER? 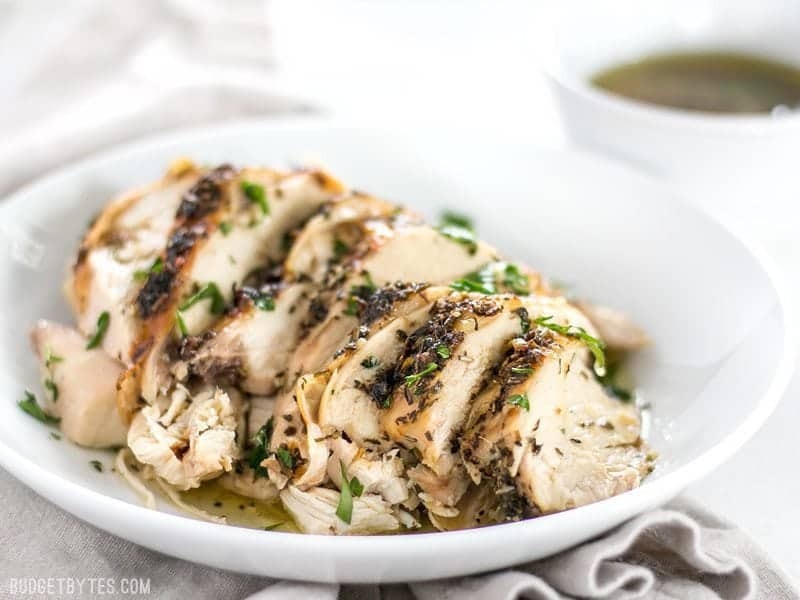 These juicy and tender Herb Roasted Chicken Breasts are a breeze to make and are a great substitute for store bought rotisserie chicken. Preheat the oven to 275ºF. 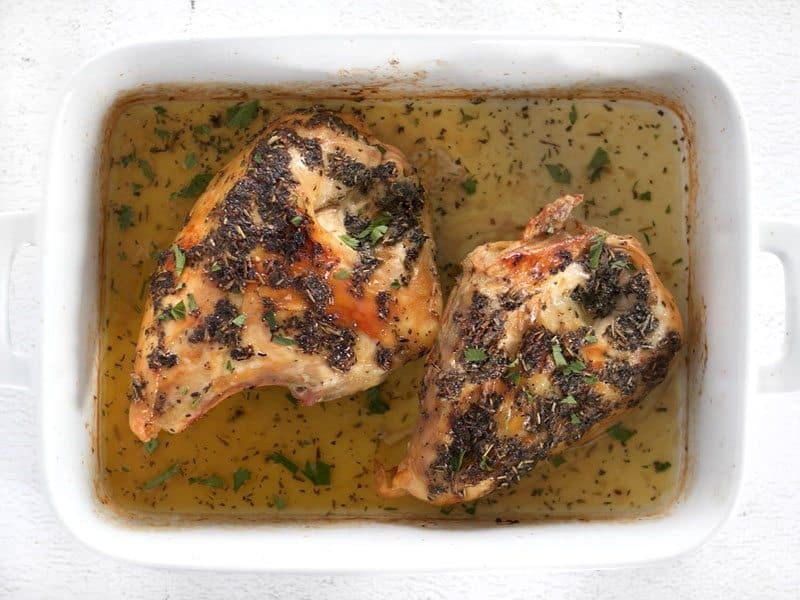 Remove the chicken from the refrigerator and allow it to warm slightly as you prepare the butter herb mix (5 minutes or so). In a small bowl, stir together the butter, minced garlic, basil, thyme, rosemary, salt, and pepper. Rosemary pieces can be quite large, so either chop or crumble the dried pieces with your hands before adding them to the mix. 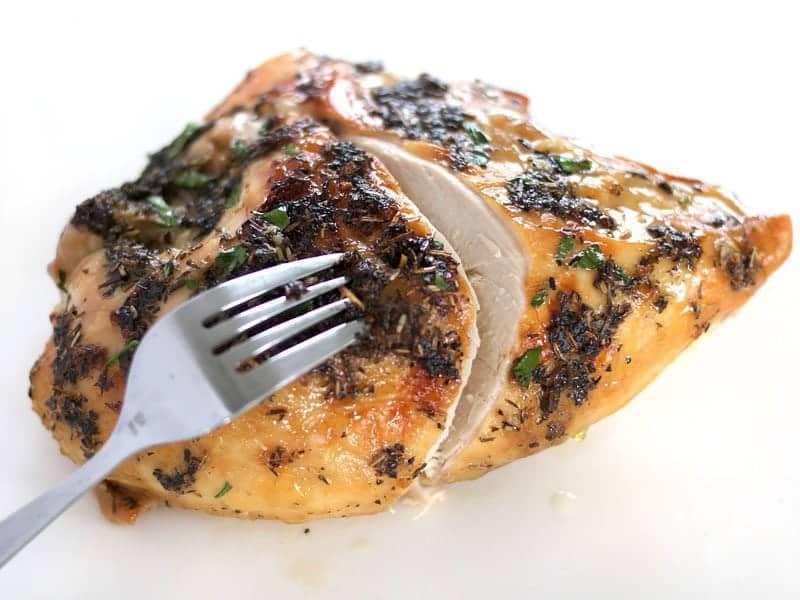 Place the chicken on a cutting board and pat it dry on both sides with a clean paper towel. 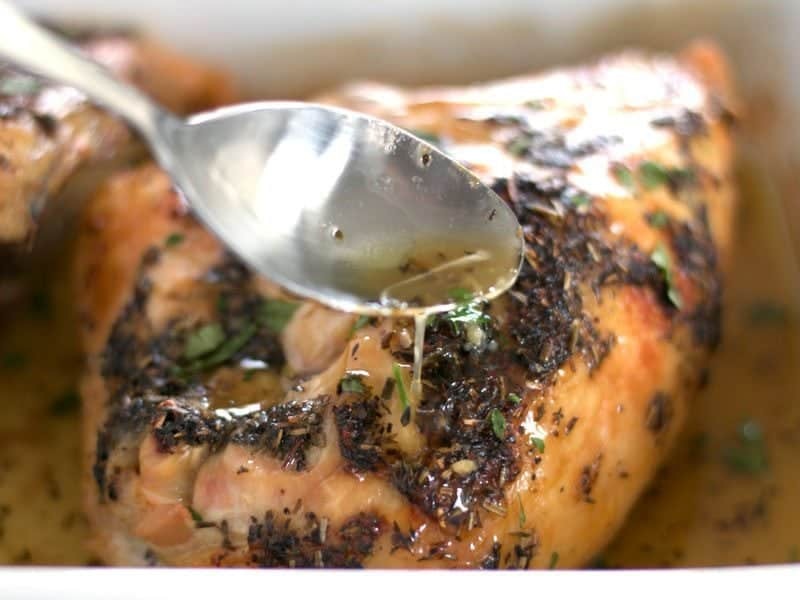 Smear the butter herb mixture over both sides of the chicken. Drying the meat will help the butter herb mixture stick. If the meat is too cold, it will form condensation as you rub the butter mixture over the surface and the butter will not stick. Place the seasoned chicken pieces in a casserole dish that is deep enough to fully contain the chicken. Cover tightly with foil, or with the dish's lid if there is one. Bake the chicken in the preheated oven for 90 minutes, basting once half way through. 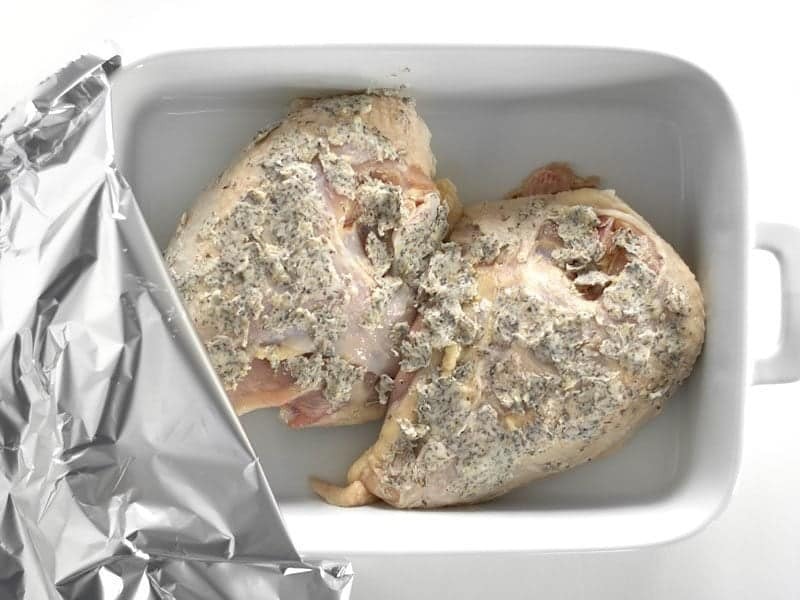 Ater 90 minutes, remove the foil, baste again, and adjust the oven's temperature to 425ºF. Bake the chicken at 425ºF for 20 minutes without the foil, or until the skin is deep golden brown and crispy. Remove the chicken from the oven and let rest for 5-10 minutes. Slice the breasts or pull the meat from the bone. Reserve the juices from the bottom of the casserole dish for drizzling over top of the meat. 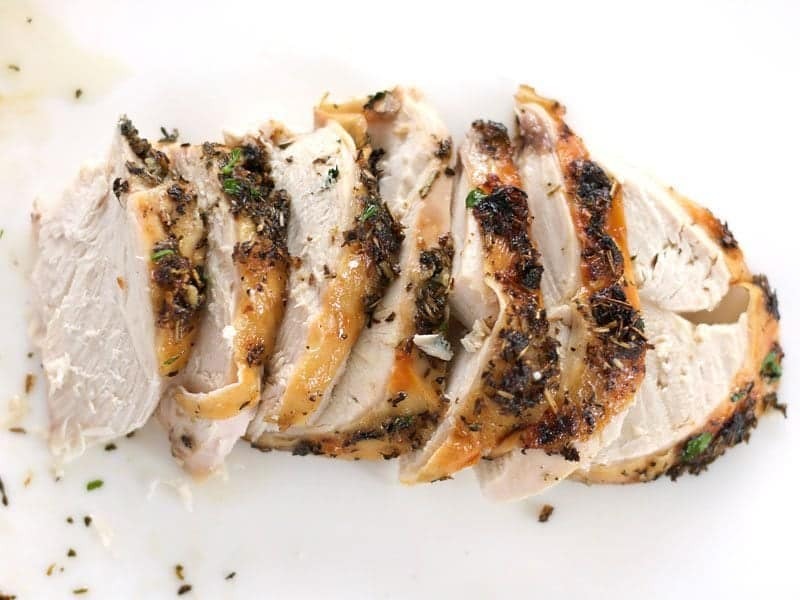 *This recipe is for bone-in and skin-on chicken breasts. 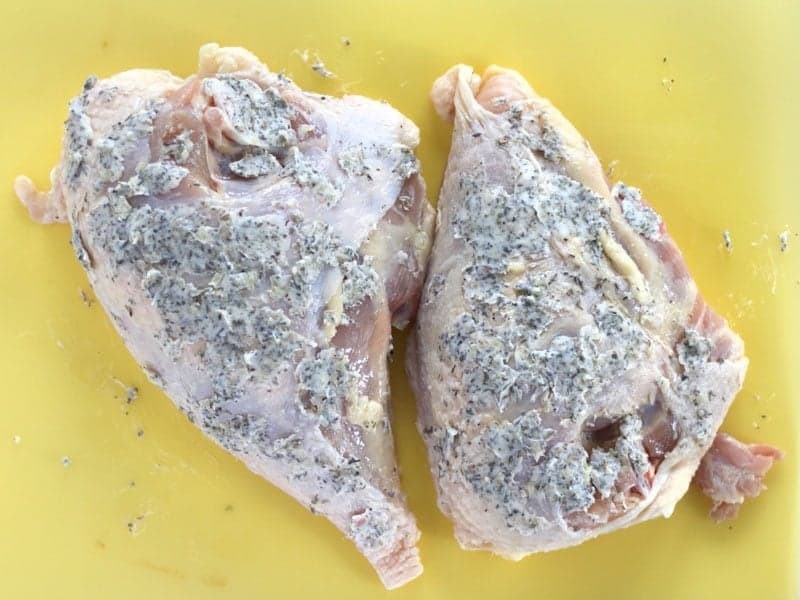 Using boneless and/or skinless breasts will require different cooking times and temperatures, and will yield different results. 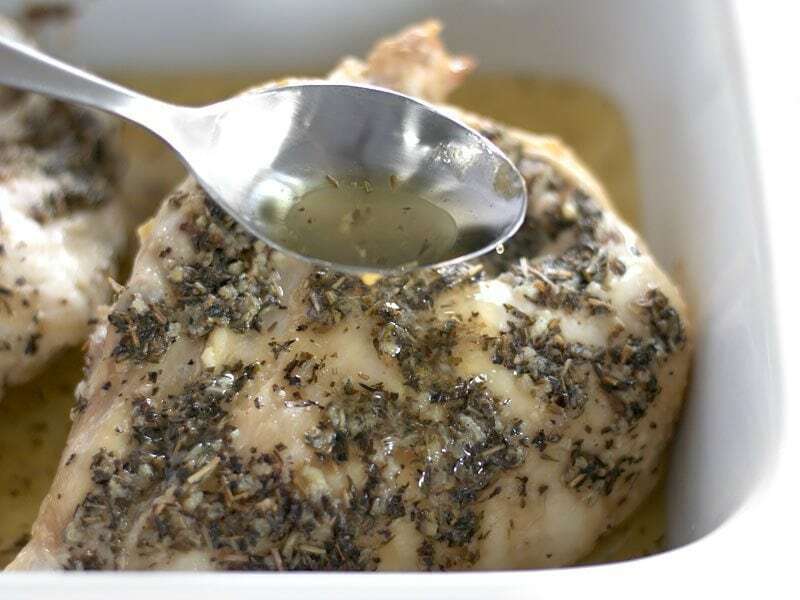 For instructions on how to bake boneless chicken breasts, visit my recipe for Garlic Herb Baked Chicken Breasts. Those juices are pure gold! Begin preheating the oven to 275ºF. Take the chicken out of the refrigerator so it has a few minutes to come up to temperature. 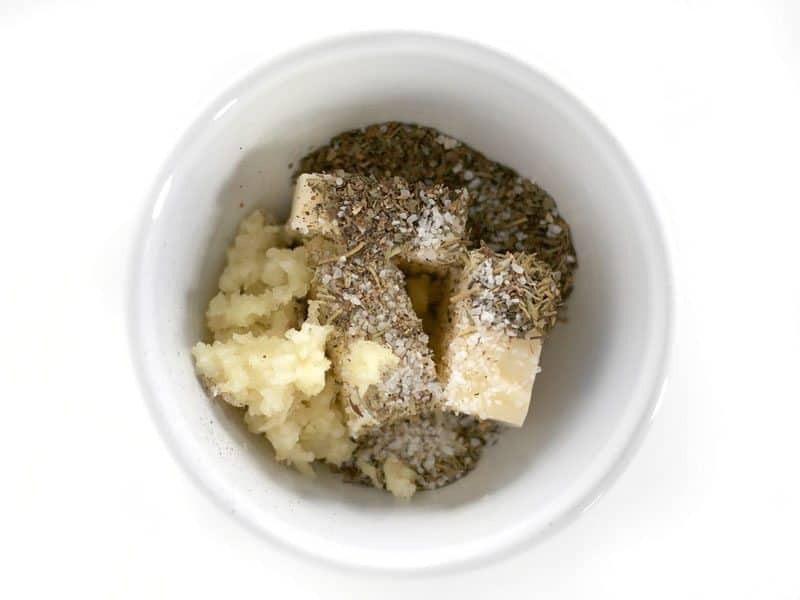 In a small bowl combine 3 Tbsp room temperature butter, 2 cloves minced garlic, 1 tsp dried basil, 1 tsp dried thyme, 1 tsp dried rosemary, 1/2 tsp salt, and some freshly cracked pepper (about 10 cranks of a pepper mill). Rosemary pieces can be large, so I just crush them up in my hand before adding them. Stir this mixture up until it forms a paste. Place two split chicken breasts (bone-in, skin-on, about 3 lbs. total) on a cutting board and pat them dry with a paper towel. They need to be fairly dry for the butter to stick. Also, if the chicken is too cold they will form condensation and become wet again, which is why you’ll want them to warm a bit as you mix the butter. Spread the butter herb mixture over both sides of the chicken, coating it in a thick layer. Place the seasoned chicken breasts in a casserole dish that is deep enough to fully contain the chicken. Cover the dish tightly with foil (this is important to hold in the moisture), or if the dish has a lid that’s even better. Roast the breasts in the 275ºF oven for 90 minutes, basting once half way through (replace the foil as tightly as possible after basting). After the full 90 minutes, remove the foil, baste one more time, and adjust the oven’s heat to 425ºF. Give it one last baste with those delicious juices for good measure and let the meat rest for 5-10 minutes. And don’t forget to pull any bits and pieces of meat left on the bones, like you would with a rotisserie chicken. It’s just too good to let any go to waste! After I removed all the meat from the bones, I gave it another good dose of those delicious juices. SO GOOD. It makes an impressive main dish, but I’m just adding a few pieces to everything I eat this week! Depending on how you serve it and how big your chicken pieces are, you’ll get 4-6 servings. Make sure to save those juices and pour them over top before stashing it in the fridge! It just depends on how much chicken you like to serve per serving. I usually keep my meat servings a bit on the small side, so I would consider each breast to be two servings, making this a four serving recipe. If you like larger portions, it would probably be two. My store didn’t have Bone-in skin-on chicken breasts only whole legs. Will my cook time be the same?? This was delicious! I had it for supper and some left over for lunch. I used boneless skinless chicken breast and did not find my meat was dry at all!. I used the drippings to put on top of my steamed veggies! What temperature/cook time would you recommend for boneless chicken breasts? I actually don’t suggest this recipe for boneless breasts, especially if they are also skinless. Unfortunately it just doesn’t work the same. The bone and skin helps keep the meat moist and remain tender. Could you do more straightforward chicken recipes without butter? Most of your simplest (in terms of flavors and ingredients) chicken recipes have butter, and I can’t eat meat and dairy together. Thanks for your consideration! I love your recipes and use them often. Can you use vegan butter? Don’t ditch the juices after the chicken is gone…. use the leftover juices to make rice. I love using a fatty, herb-y, buttery broth to cook rice in! Just add enough chicken broth to make up the difference if there is not enough liquid. Love this idea! Thanks for the suggestion! What would you recommend for cooking temperature/cook time if I did this with an entire chicken? Unfortunately it’s really hard to say without testing it. I’m not very experienced with roasting a whole chicken, so I can’t make an educated guess. I tried this recipe tonight and the chicken came out a little dry. Would you suggest a lower baking temperature, or a shorter baking time? I know I’m not the OP, but I would recommend adjusting the baking time. Dry chicken usually just means it’s overcooked.